Hope you had a happy Halloween. Ours was lots of fun, and thankfully, the cold and rain held off until right when we were all ready to go in anyway. This year, I only made one costume, since my daughter only needed a thrifted dress for her “diva” outfit. 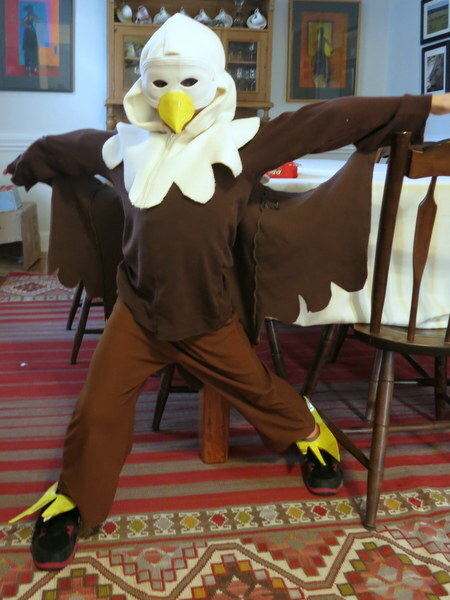 Our son, seven, wanted to be a bald eagle. He has a thing for birds of prey. At one point it seemed his visions were never going to match up to reality, but in the end, both of us were happy with how it turned out. It’s made from four thrifted items: brown jammy pants (unaltered), long-sleeved brown T-shirt (sized down), brown henley shirt (cut open and scalloped for the wings), and the cut-off top of a fleece hoodie (sized down and scalloped for feathers). My son made talons made of yellow foam and cardboard. 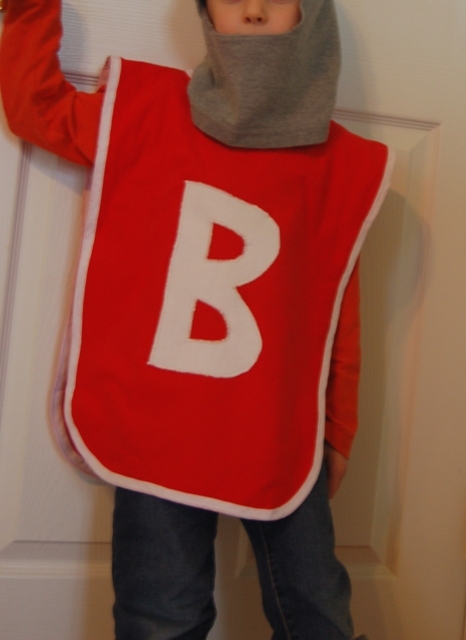 He also made the foam beak, which he attached to a pre-bought plain white eye mask. I tried to convince him to just attach a beak to the hood, but he was having none of that. I thought he did a great job making eagle poses here. 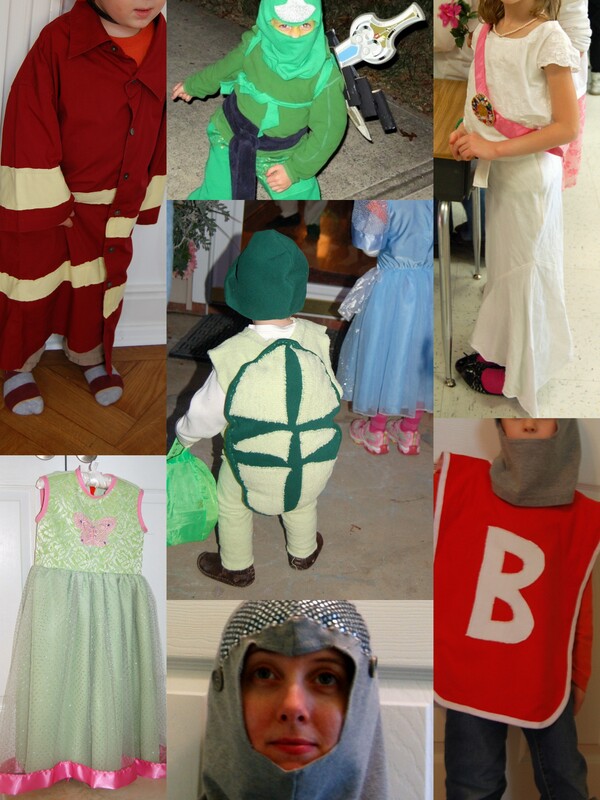 For more semi-homemade costumes from previous years, click here. Meanwhile, I’ve been slog, slog, slogging through my novel rewrite. Also, enjoying the fact that Bletchley Circle has new episodes. Woo! 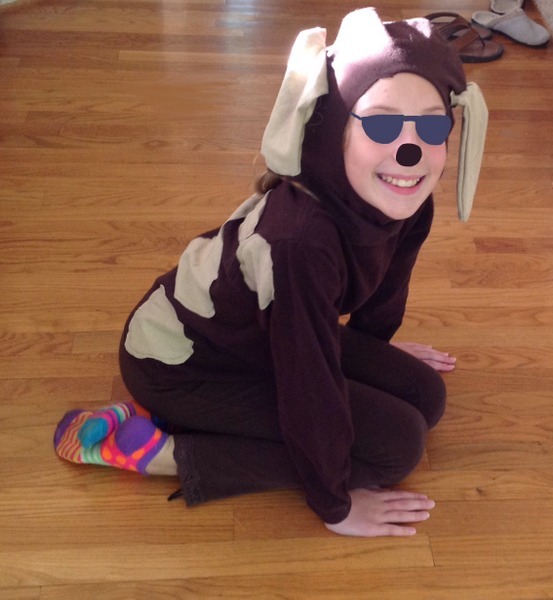 It’s time for the yearly round-up of costumes, in case you need some ideas. What are you dressing up as? Last year, I was the Prancercise Lady, but it’s going to be hard to top that one. The kids want to be a diva (10 year old) and a bald eagle (7 year old). We’ll probably get started on costumes this week. This always starts with a trip to the thrift store. Our costumes are of the slapdash variety—-altered rather than sewn from scratch, with not too much (okay, almost no) emphasis on perfection. So glad to get my copy of the Budget Bytes cookbook the other day. If you haven’t yet discovered the Budget Bytes blog, you’re in for a treat. The recipes are on the simple side—weeknight friendly, for the most part, but not boring in the least. As the title suggests, the recipes are wallet-wise, but beyond that, they’re just appealing, and in many cases, less-meatarian, which I love. Also many are gluten-free or easily adaptable to GF. I checked the book out from the library and liked it so much I had to buy my own. Discovered another new-to-me podcast for children’s and YA lit enthusiasts. It’s called First Draft, and it’s interviews Sarah Enni conducted with authors during a cross-country road trip. Good stuff, food for thought. What about you? Discover anything good lately? At the recommendation of a friend (thanks, Catherine!) I bought Into the Unknown: How Great Explorers Found Their Way by Land, Sea, and Air for my six-year-old boy for Christmas. 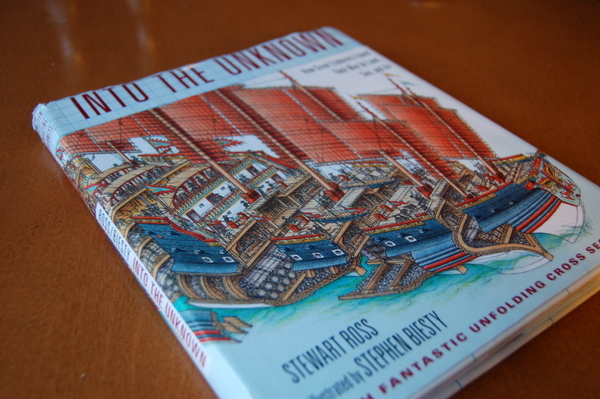 It’s a beauty of a book, written by Stewart Ross and illustrated by Stephen Biesty (of Incredible Cross-Sections fame). 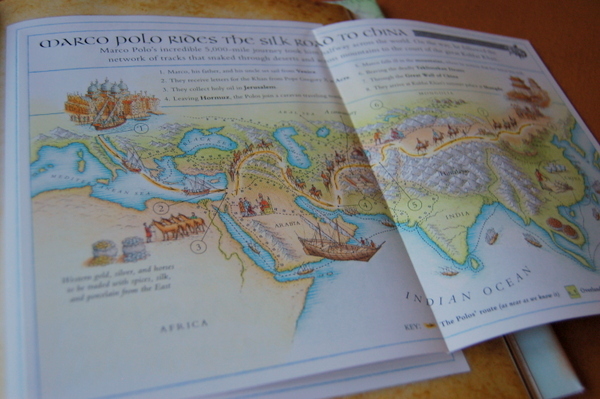 Each chapter follows a different explorer and includes a gorgeous fold out map and diagram of the explorer’s route and travel style. I highly, highly recommend it. Reading it straight through from beginning to end isn’t something my son is ready for (the text is geared toward a slightly older audience), but he likes to pick a small section for me to read at a time, and he always chooses a fold-out to study. He wants to read every label for all the parts (not unlike his fascination with Richard Scarry’s books). I love that feeling of just sort of soaking in the book, meandering through and getting to know it bit by bit, landing on favorite parts and coming back to them again and again on a nonlinear journey. It reminds me of my own love for the Oxford University Press story collections as a kid. Beautifully illustrated by Victor Ambrus, they were these great kid-friendly versions of the Canterbury Tales, the great ballets, and King Arthur’s tales, among others. Sadly, they look to be out of print now, but I think I’ll have to chase down some copies to have as our own. Click here for a few cover images from Victor Ambrus’s website. I didn’t understand everything about those tales at the time, but when I re-encountered them later in school, it was thrilling to realize I already had a framework in place. 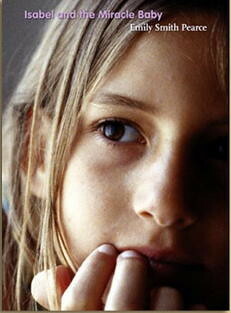 The stories were familiar and felt like they were already mine. I’m always hoping to give my kids some experiences like that, and I hope Into the Unknown will be one of them. 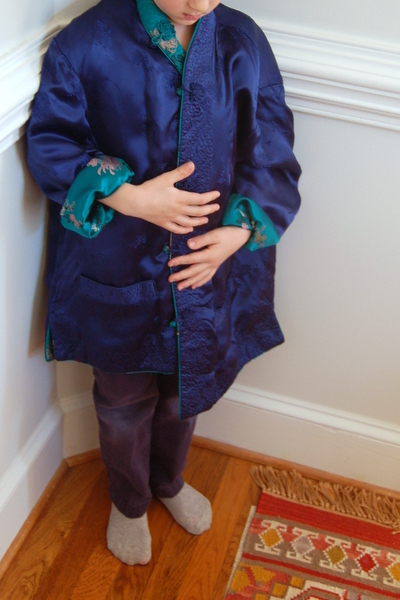 We found a silk jacket at the thrift store (100% real! reversible! 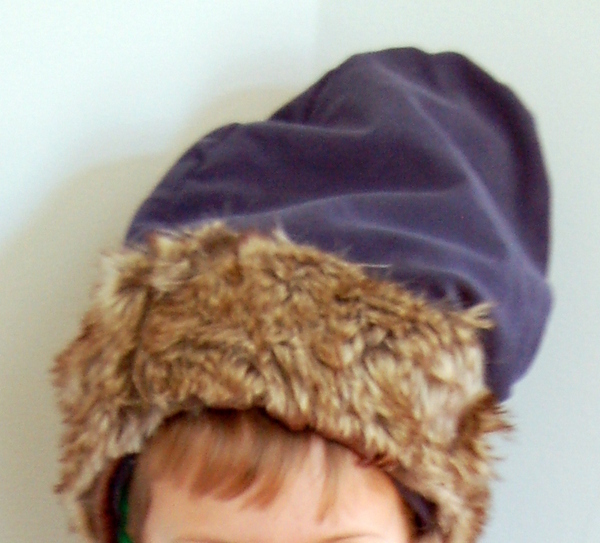 ), along with a faux fur shrug we could use for the hat. I made the hat (two U-shaped pieces sewn along the curve) from an old T-shirt with a double-thickness of sweatshirt underneath for body. I tacked the fur band around the bottom. Since I’m working on a nonfiction children’s book myself, I have a new appreciation for just how much research goes into something like this. I can’t imagine how long it must’ve taken Mr. Ross and Mr. Biesty to create this handsome book. Bravo! 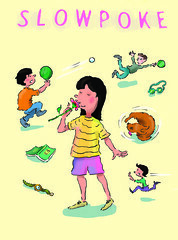 Speaking of nonfiction for children, I just ordered a couple from my favorite local indie, Park Road Books. Amy Karol of angry chicken recommended two comic-type books, one about the presidents and another about the Greek myths: Amazing Greek Myths of Wonder and Blunder, and Where Do Presidents Come From? They sounded so good that I called up Park Road right away. I’ll be there tonight for the spring author line up, sponsored by the local chapter of the Women’s National Book Association. P.S. Family: I’d like to get this book (Into the Unknown) for the oldest nephews, so I’m calling dibs now. Sorry! It’s that time of year again. Time to slap together a costume or two! I thought I’d list some of our past hits as inspiration for you. I don’t put a lot of fuss into making costumes, but I do like them to be comfortable and reusable. My favorite method involves hacking items we find in the thrift store. 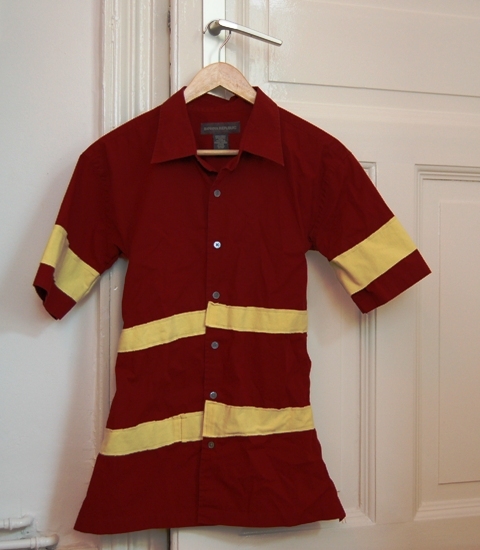 It’s inexpensive, much of the sewing is already done, and the fabrics are often more comfortable than those used in store-bought costumes. One more idea for you. 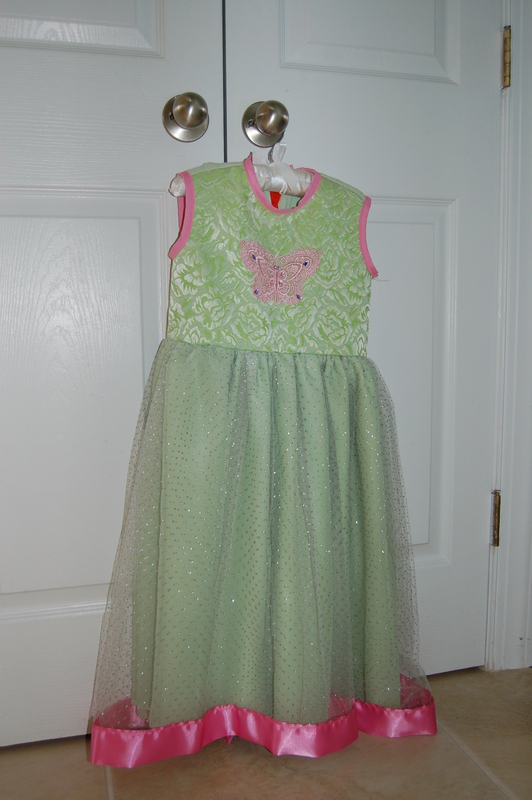 My niece is evidently going to be a mermaid, and I loved the look of this simple costume her mom showed me. I hope these inspire you. 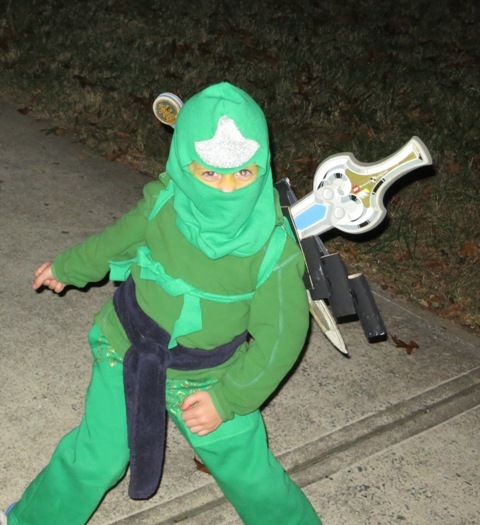 This reminds me, I have to get my kids to commit to their costumes now, too. If they had their way, they’d probably get 10 costumes and choose one at the last minute. Ha! I had to whip up something quick for my daughter’s Wax Museum Day at school. 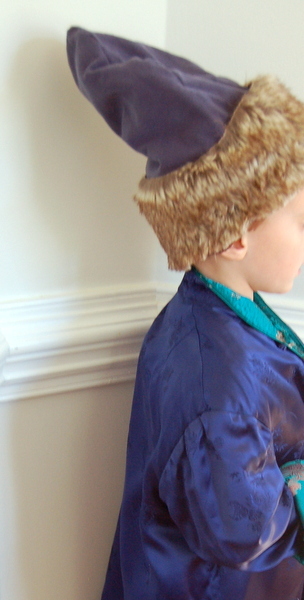 This is a grade-wide project where the students read a biography, dress up like their historical figure, and prepare remarks to present to visitors. The students are supposed to stand still like wax figures until a parent gives them a ticket. Then they animate and introduce themselves as “so-and-so.” It’s so totally cute I can’t even tell you. I’m partial to the costumes involving mustaches. 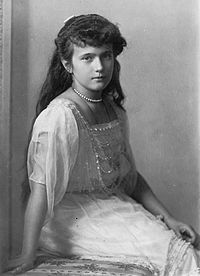 Little Miss wanted to be a princess, of course, so she chose Russian princess Anastasia Romanov. We went to the thrift store and chose some pieces to alter. 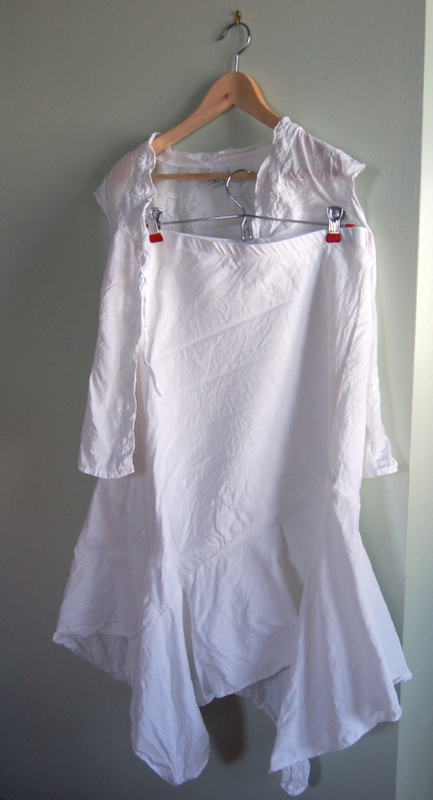 The key elements, we decided, were a white flowy dress with a square neckline, plus pearls. I flipped the blouse backward, sized it down, and made a square neckline using a tutorial I can no longer find. It wasn’t as difficult as it might sound—-actually pretty easy. The skirt I just sized down but left otherwise as-is. 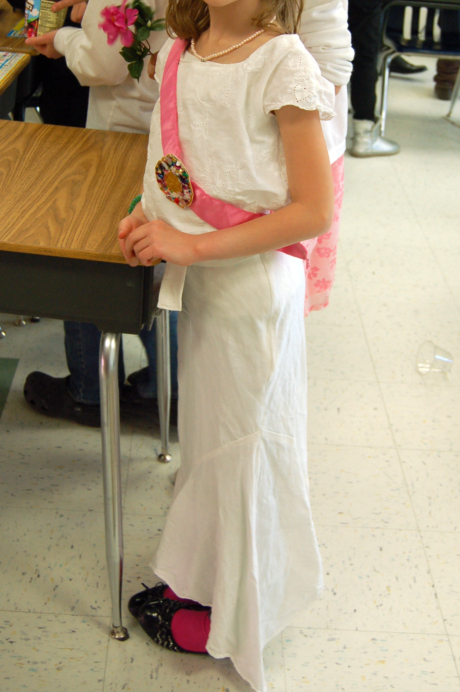 Then I added, at her request, a sash made from blanket binding. 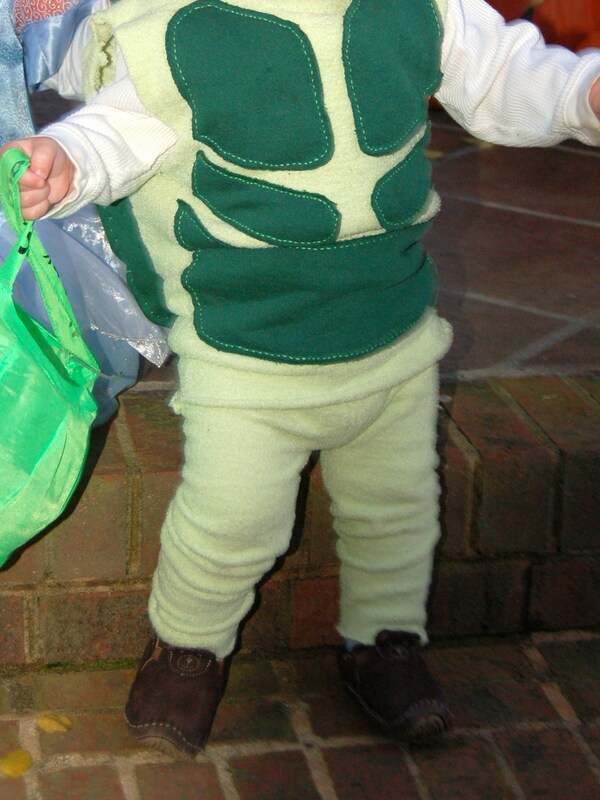 It was once a part of this costume but got accidentally ripped off. I also made a little medallion from lightweight cardboard and sequins. She did a great job with her presentation and is now reading everything she can about Anastasia. I guess we should try that movie that was made in the 90s, although I’m sure it’s more fiction than not. Did you go away for spring break? We visited family in California and went skiing. It was a blast, but coming back to East Coast time is not. Oh well, it was worth it! * The Anastasia image is from Wikipedia.